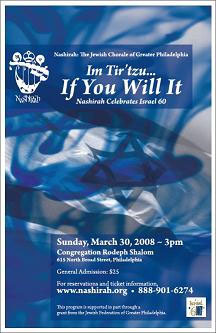 March 30 at 3:00 P.M.
Sunday, June 3, 2007, at 7:30 p.m.
HaShoah, Yom HaAzma-ut, Lag ba’Omer, Yom Yerushalayim, and Shavuot, plus May Day. Three mid-March Choral Concerts in Caldwell, Jersey City and Manhattan will light up a sacred bridge. 7:00pm @ JCC Metrowest, West Orange NJ – free! 7:30pm @ Mo Pitkin’s – Judeo/Latino cuisine! ‘Supergroup’ Mikveh features the top women in Klezmer, including renowned Yiddish singer Adrienne Cooper, Klezmatics founder Alicia Svigals on fiddle, charismatic trumpeter Susan Watts of the Hoffman klezmer dynasty, ethnic accordion wizard Lauren Brody and jazz bass phenomenon Nicki Parrott. Together, they rock out with sizzling dance music and riveting Yiddish/English songs, both ancestral and brand new. Saturday Night, October 23rd, 8:00 p.m. Tenor Richard Lenatsky returns to sing Yiddish songs, accompanied by Alexander (Sender) Botwinik and Marvin Weinberger. have upcoming performances in PENNSYLVANIA, NEW YORK and NEW JERSEY, USA. YIDDISH – and JEWISH – CHORUS IN THE WORLD. who might benefit from it.